This week we are bringing in change to help build a well in Africa, and it is so exciting that we are in the top 5 classes of the whole school! If we continue to remain in this spot we will get to dump whipped cream on our Administration! Please continue to be awesome and bring in any change that you can! Friday is a dollar dress down day to help with this cause! Thank you for all that you do! Let’s do this!! Today we attended a fun assembly by WHOlives. Their mission is to bring water, health and opportunity to children in developing countries that are at great risk, due to scarce and contaminated water. We discussed the world water crisis and were invited to participate in the Change for Water Challenge. 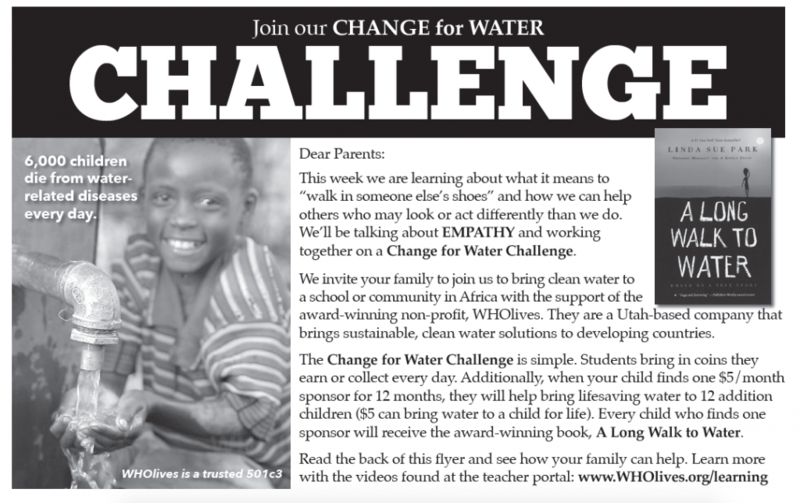 The Challenge invites students to bring in coins throughout the week to help create a well in Africa. Students are encouraged to do chores at home or for friends and neighbors to earn the coins to bring to school each day. If you would like to submit a piece of art in the Arts Showcase, we will be collecting these soon. You may enter more than one art piece in the showcase. 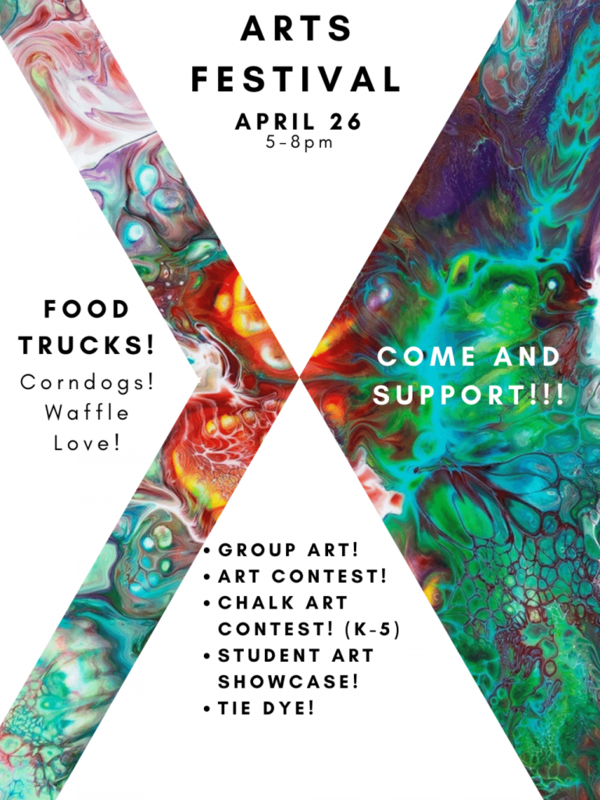 Also, stay posted for information on the group art project and shirt tie dying. Finally, the coloring page for the coloring contest will be distributed to teachers next week. It will be due back to your teacher no later than Wednesday, April 24th if you would like it to be judged in the contest. Important: May 6th (Mon.) through May 10th (Fri.), we will not be having regularly scheduled class. Instead, we will be doing end of year testing. We will be administering the two main State mandated tests, so it is extremely important that your child comes rested and ready to work. I need ALL students to show up to be tested. I have created a sign up account in Sign Up Genius. As soon as possible, please schedule a time that works best for you to bring your student into our classroom for testing. We are excited for our next field trip! We are going to be visiting the SeaQuest Aquarium on Friday April 12th. 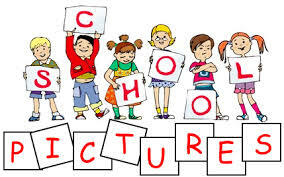 All AM and PM Kindergarteners will be meeting in the classroom at 8:30 am and we will be returning to the school at 12:00 pm. I do need some parent volunteers. 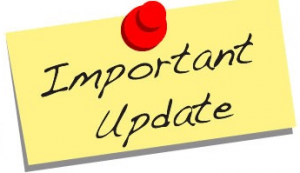 Due to the space, SeaQuest has asked us to limit our parent help to 5 parent volunteers per class. I need 5 parents from AM and 5 parents from PM to help us out. I will be taking the first who fill out the form below. *AM and PM meet in classroom at 8:30 am. *Please plan accordingly to have your kindergarteners picked up on time at 12:00 pm. *Please make sure your student eats breakfast because there will not be a lunch. *Please DO NOT send your student with $ money for the gift shop. Thank you so much and if you have any other questions, please let me know. Monday: Library! If your child did NOT bring their library book please send it with them to school ASAP. Friday: Dollar Dress Down Day! SPRING BREAK! No school next week! We will be sending home pages in your kiddos folder before Spring Break. Please be looking through their folder for these announcements regarding upcoming events, and information about the end of the year! Thank you for everything you do! Have a great week! Monday: Library! Most of our students did not check out a book last Monday, but if you have a library book that needs to be turned in please bring it! Friday: Dollar Dress Down Day! Our Rube Goldberg team took 1st place in the State competition and will now be heading to Lawrenceburg, Indiana. The proceeds of the dress down will be going to help our Rube Goldberg team go to the national finals competition.Have a great week! Due to scheduling conflicts the Q and U wedding that was planned for Thursday will be cancelled. We will not be dressing up that day. Please remind kids to wear their school uniforms. So sorry for the changes. 1) Show everyone a Thing or two. Grab a friend and dress as Thing 1 and Thing 2. 2) Green eggs and ham anyone? Wear a green shirt, pants, socks or accessories to school. Please remember all clothing must still meet the dress code policy, and any student who chooses not to participate will wear their school uniform. Have a great, and safe weekend!